Ruger #1 Rifle custom shop services: Hicks #1 Harmonic Accurizer, custom trigger and hammer work. Email Bargains - Check Often! Ruger Number 1 and #3 Accessories - Hicks Harmonic Accurizer, our new Adjustable Trigger, and our Slip-Over Scope Mount for the Ruger Number One and other Ruger #1 Accessories. The Hicks Accurizer for the Ruger #1 will tune the harmonics of the Ruger Number One forend hanger to give the best accuracy. The Kepplinger Trigger for the Ruger Number One was a Set Trigger that replaced the factory Ruger #1 trigger. The Moyers and Kepplinger Triggers and Mould's Speed Hammer have been discontinued. Our new "Slip-Over" Ruger #1 scope mount solves the problem of aligning an after market scope base on a contoured barrel... It uses the factory pre-aligned rib as an alignment shim! 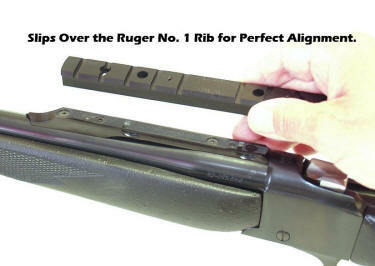 Now you can have a precisely aligned Weaver style scope base on your Ruger #1! Installation is Easy - Remove the screws from the original rib. It will stay in place with the recoil pins. Slip the Slip-Over Mount onto the rib. Install our replacement Allen screws. Getting an aftermarket scope mount to align properly when mounted on a contour barrel has always been a challenge. Every one of them is a potential hand fitting job... But not with the Slip-Over! The machining is precise. The finish is exceptional. And, the design is ingenious.